Once again, the Gators’ collective lack of size and cold shooting stretches cost them a basketball game. This time, it cost them their season, too. 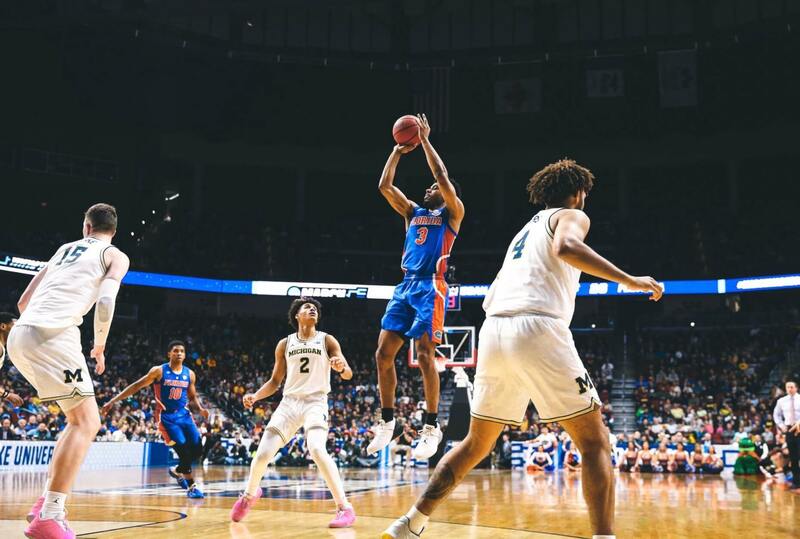 Michigan held Florida to 34.5% shooting, did just enough for itself offensively, dominated the boards by a 42-29 margin and the Wolverines ended the Gators’ season with an ugly 64-49 victory in the Round of 32. It’s the second straight season Florida has bowed out in the second round. Last year, it was Texas Tech who bounced the Gators when a last ditch KeVaughn Allen three pointer banged off the rim as time expired. It didn’t come down to that this time. Florida hung around for awhile, to its credit. After falling behind 15-6 in the opening minutes, Florida launched an 8-0 run to trim the deficit down to one on threes from Noah Locke and Jalen Hudson, plus a dunk by Kevarrius Hayes. Michigan then rebuilt a six point lead before the Gators again cut the Michigan deficit lead down to one, at 29-28 with two minutes left in the half, on another Hayes dunk. Then Michigan launched a third, and much more damaging run. And for this one, Florida had no answer. The Wolverines’ Isaiah Livers drained a three just before the half to make it 32-28. No sooner had the teams returned to the floor than Ignas Brazdeikis popped another one. That was followed up by layups from Jon Teske and then Jordan Poole, the latter of which was an and-one. Thus, the Michigan lead ballooned to double figures. And it stayed there for most of the remainder of the game. Florida, which finishes the year 20-16, will probably want to attach its copy of the box score to a piece of cinderblock and drown it somewhere in Lake Alice. Florida did hit nine threes, but the Gators shot 29% from the floor the second half and 34.5 for the game. Worst of all, Florida finished with 49 points, its lowest point total in Mike White’s four years in Gainesville. But the stats don’t hold a candle to the visual memories of this game. What Florida fans are likely to remember from this team’s brief NCAA Tournament run was this Gator team riding a makeshift offensive strategy to a first round victory, and then riding that same strategy to a blowout loss two days later. Florida had success against Nevada slowing down the offense, running down the shot clock and ensuing that a good shot would result from the possession- at least until Nevada pressed. Luckily, Florida would figure it out in time to hold on. But that slow tempo played right into Michigan’s hand. The Wolverines- who overtook Texas Tech to become the most efficient defense in the nation with .857 points allowed per opponent possession- gladly let Florida slow things down, and then tightened up. That fatally garroted the Gators’ already limited offense, and once Michigan extended its lead to double figures, the game was over. And all that makes it all the more galling that this game was the end of the road for three Gator seniors- Kevarrius Hayes, Jalen Hudson and KeVaughn Allen. These three guys were admittedly physically limited, but all three shined as prime examples of what college sports should be about with so much shady activity taking place throughout the enterprise. You could frequently find these guys prostrated on the floor, fighting tooth and nail for every loose ball (remember when Allen literally dove to the corner to save a ball against Mississippi?) and if nothing else, it’s that kind of hustle and effort that can lay the groundwork for the guys who return as well as the newcomers. So, a special thanks to those three guys. I’m truly sorry that it had to end for them in such ugly fashion. But hopefully, at some juncture in the future, when the sting of this loss fades, they’ll be able to look back at this game, and this season, and come to terms with the fact that this ending was perfectly fitting given the sample size this batch of Gators had produced in its first 35 games. And hopefully starting tomorrow, this game, and this season will serve as points of motivation for a team that’s one year older, one year smarter, and one year better.